All Milan supporters without exception are in a sorrowful state of mind these days. After losing the title, we said goodbye to several legends of Milan and world football. To put it in plainest terms, whoever remained unemotional when Gattuso, Nesta, Inzaghi and Zambrotta said their goodbye to Milan might as well put on a black-and-white shirt and put up a poster of Conte on their wall. While Elaine prepares her tribute posts for these red and black legends, I’m going to be that petty guy that points an accusing finger at those who lost the scudetto this year. The judge and the jury, if you will - self appointed, self proclaimed and ultimately insignificant, but still - a sentence will be given. Without further ado, here’s a list of 4 people who needed to do better in order for Milan to retain their crown. Why 4? Because nobody ever makes a list of 4 anything, and my ego wants me to be a pioneer in this regard. 4. Alberto Aquilani - The midfielder came from Liverpool as an Italy international and the man who was going to make the transition from a non-Pirlo driven midfield easier. He had some good performances in the first half of the season and racked up a few assists - but he never managed to be the driving force that our midfield needed. While Nocerino and van Bommel were excellent, they are not creators - it was obvious that it should have been up to Aquilani to provide a consistent source of long passes and through-balls for the forwards. After his injuries, things took a turn for the worse and as the end of the season neared, Milan gave up trying to create from the middle altogether - and switched completely to a ‘Ibra knows best’ strategy. With that said, I think Aquilani should stay. With Montolivo’s arrival next year, the pressure on him to create won’t be so great and you do get a lot of bang for your buck (7 million bucks, I believe). 3. Taye Taiwo - God’s gift to Milan turned out to be nothing but some guy passing through. Many were pleased to get a left back as explosive as the Nigerian (including me, but I’m not linking to the article as it might be too embarrassing). Why he failed so miserably, I don’t know to this day. What I do know is that his failure left Milan struggling in the same position we’ve been struggling ever since Maldini moved from left back to center-back and Kaladze lost the plot. For another year we’ve had to endure watching Bonera and Antonini at left back, we even had the pleasure of seeing an utterly average Algerian signed as an emergency patch in the winter window. 2. Max Allegri - I like Max. I don’t want to replace him. He can stay at Milan for 10 years and win a bunch of trophies. With that out of the way, this season he showed all the flaws of an inexperienced coach, which I can’t forgive because anyone who’s ever played Football Manager for 2 days knows not to play the best defender in the world if he’s 70% fit in the middle of the toughest run of games in the entire season. Yes, all of that needed to be bolded. Playing Thiago Silva against Roma like that was nothing short of criminal, and if I was in charge that night, he wouldn’t be Milan’s coach in the morning. I’d regret this impulsive decision later, but nevertheless, the Thiago Silva felony wasn’t an isolated incident - throughout the season, he has refused to rotate players, which undoubtedly worsened the already bad injury situation. Nocerino miraculously survived through playing 90 minutes of every game, while others like Boateng, Abate and van Bommel weren’t so lucky. Even in cup games, we played with at least 7 or 8 regular starters - another criminal moment of the season being the rematch against Juve, which preceded the run of games that ended our hopes in every competition. Not only did we not rest all the half-fit players (including, even then, Thiago Silva) but the team allowed the game to go to extra time, and completely drain what strength was left in them. Apart from amateurish player mismanagement, one more thing strikes me as Max’s problem - the refusal to stray even slightly away from his 4-3-1-2 formation. I like how the formation works, and he has managed to give it width and penetration by sending the forwards wide and midfielders into the box. However, when it wasn’t working, there was never a change. We saw something resembling a 4-3-3 on a few occasions, but that never produced any results to speak of. What’s striking is that Emanuelson, who has played as left back, central midfielder and trequartista, never actually played on his natural position on the left wing. Not that I remember at least, correct me if I’m wrong. 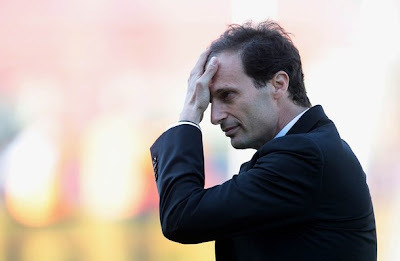 Allegri has the potential to be a great coach, but he’s still shaking off a beginner’s problems - last year it was the substitutes, this year it was the lack of rotation and rigid tactical attitude. As long as he works on that, I’m more than happy with keeping him for next year. 1. Robinho - Yes, Mr. I miss things Jovan’s mom wouldn’t miss was the difference between a scudetto and a second place finish. When one of your starting strikers misses sitter after sitter throughout the season, it’s a devastating blow to your chances, regardless of his work rate. With a tally of a measly 6 goals in 29 games, he couldn’t be counted on to hit the back of the net even when it was harder to miss. I mean that literally, when you’re 1 yard away from the goal line and the ball is near the ground, do you know how much effort it takes to put it over? But our man has managed to do just that at least 5 times this season, and if you search ‘Robinho misses’ on Youtube you can create a nice playlist of would-be goals that wound up being disappointments for Milan fans. Whether the game is crucial or not, and regardless of whether the goal was needed in order to win the game, hoping for Binho to hit the net is like playing roulette and betting on zero over and over again until you wish you had Tevez spinning the wheel. Many will say that our attack is the best part of the team, and that’s true when Cassano and Pato are fit, but if Pato is sold, I do want a striker who would score 15 goals if he played 29 games. Is that too much to ask for? Titles aren’t won with one man scoring the goals, that you can be sure of. Whether it’s Tevez, Balotelli, Falcao or whoever, Ibrahimovic needs some relief because with Robinho as his regular partner he might need to score 40 goals next season in order to win the scudetto. Thanks again, Jovan. If you are interested in reading some of Jovan's more popular posts, try the one on Savicevic & Boban, his recap of the 0-0 draw at Roma last year when we won the Scudetto, his ode to Thiago Silva, his channeling of Ibra for the Malmo friendly last summer, or his comparison of Milan and Inter from the beginning of the season.